The Arab region is one of the most urbanized and rapidly urbanizing regions in the world. Whereas in 2010 about 56% of the total population lived in cities, in 2050 the percentage is expercted to have risen to 68%. Cairo is predicted to remain the largest city of the Arab region, growing to 16 million inhabitants in 2050. Over the past decades the mean annual air temperature in the Greater Cairo Region has been steadily rising and is expected to rise further. Electricity-based cooling solutions (using air conditioners) have been used to mitigate heat stress in the city. However, this appraoch is counterproductive with regards to mitigating climate change and also over-stresses the electricity grid each summer. Rooftop farming has been used in a number of locations in the Arab World as an adaptation intervention that acts to reduce localised heat stress, improve living conditions and to generate income. The prevailing flat roof-tops across the region provide a good basis for such an intervention. 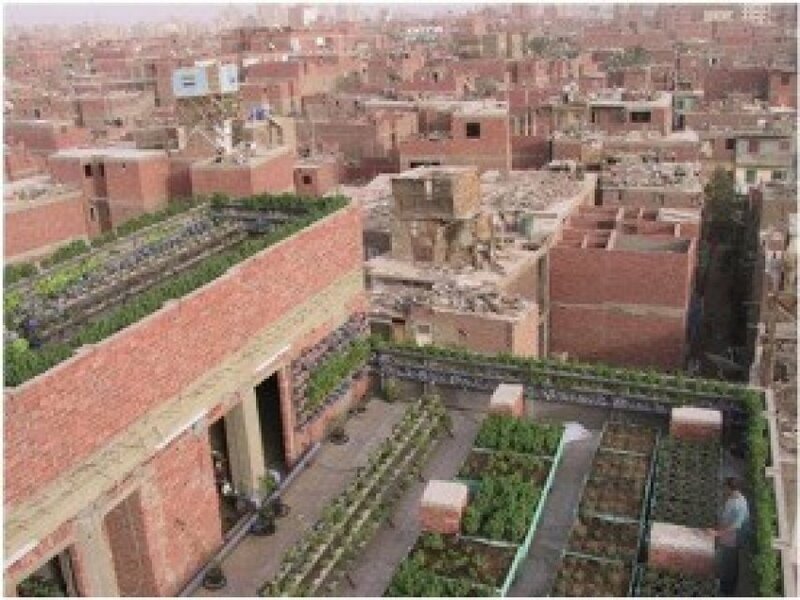 This pilot case study* “Urban Agriculture in the Greater Cairo Region – The Example of Rooftop Farming in Informal Settlements” aimed to exemplify the use of rooftop farming to reduce climate vulnerability in information settleements. GIZ, commissioned by the Federal Ministry for Economic Cooperation and Development (BMZ), implemented the project in cooperation with two NGOs - the Participatory Development Programme in Urban Areas (PDP) and the Research Centeron Urban Agriculture and Food Security (RUAF) - and the private Schaduf Company, which was established in 2010 as an Egyptian rooftop farming enterprise designed to empower and sustain Cairo’s low-income communities. *Download the pilot report from the right-hand column. A pilot project on urban rooftop farming was implemented in the Informal Settlement Ezbet el-Nasr, Greater Cairo region, in 2014. The implementation started with the selection of participants, followed by training and the technical setup. In order to be able to cover the costs for the technical installations, the low-income families received repayable loans (by Schaduf Company), which were repaid by monthly crop sales. Farmers were typically able to repay the loans within one year. Families kept roughly 10 percent of the crops grown for personal consumption; Schaduf Company purchased the remaining produce, reselling it to local markets with profit for the farmers. A hydroponic system of waterbeds was proposed and installed by Schaduf Company directly on the rooftops. The model consisted of 3–4 water beds (of 3.75m2 each) on each rooftop. The complete model costs around 1,575 EGP (175 €) for 3 beds. The costs include fertilizers, seeds and technical support for six months. The forecasted income was about 300 EGP (33 €) per month per 15m2, yet in reality turned out to be less. The hydro- ponic waterbeds were made of wooden frames, plastic sheets, foam panels and cups filled with peat moss and pyralite substrate. The 15cm deep water is supplied by a water pipe through an electricity connection from downstairs and maintained by a water pump and water filter. The crops grown were gargeer (Eruca sativa, ‘Rucola’, Fig. 3), mint (Mentha spicata), molokheya (Corchorus sp. ), onion, cherry tomatoes, strawberries and flowers. During the cultivation period the project was technically supported and monitored. Rooftop farming (as well as other types of urban agriculture) has a positive impact on microclimate and environment, food security and income, economic development as well as community participation. It bears great potential for the integration of marginalized groups, e.g. women and youth, and can be regarded as an option for adaptation to climate change in urban environments. The remaining technical bottlenecks have to be tackled by on-site experimentation. Cooperation with other rooftop farming projects e.g. in Tunisia or the West Bank is recommended. Transferability: A precondition for any transfer is the availability of an agency, a NGO or a socially oriented enterprise (or a combination of all) with a good background in rooftop farming, which creates the framework conditions, including micro-finance, micro-insurance, input-supply, marketing and monitor- ing. In regard to marketing, the production for niche markets should be considered, offering special rooftop farming products “pesticide-free”, which will fetch higher prices. Recommendations for decision makers: Community and institutional stakeholders have to be identified, training needs and participatory capacity building have to be assessed and (micro-) financing and micro-insurance models should be investigated. Funds have to be secured in case the agencies involved will not cover the costs. Women and youth should be specifically targeted. Marketing strategies based on a prior market and value chain analysis have to be developed. A broader and more in-depth capacity building and training appears to be crucial relating to specific knowledge about rooftop farming. Capacity building should target the participants themselves as well as possible partners (NGOs) and have the form of so-called urban producer field schools (capacity building workshops on-site). More information (e.g. about financial costs of the installation and operational aspects) would enable residents to participate better in the whole project and finally lead to their full empowerment as responsible actors within the project. Monitoring should start from the selection of residents and evaluation of the training sessions until the end of the production circle (costs, consumption, harvest, etc.). On the technical side there are several options to cultivate the crops. Aside of the hydroponic system mentioned (waterbeds on the floor), a hydroponic system on tables and a soil-based system on tables were tested. But many more options have been tried in other locations and all of them have their pros and cons and more tests are needed to find the most suitable one for each case. The biggest challenges for the rooftop farmers were irregular water supply and electricity cuts and the increasing heat stress in the city. The main driver of motivation is income generation. Microcredits and micro-insurances could ease the implementation of rooftop farming.